Another photographic journey in the city of Chicago, Illinois. This book takes you through the quintessential American city and allows the city to reveal itself as a giant, living, breathing museum exhibit. Colorful delights, epic architecture, grit, grime, beautiful boulevards, lonely alleys, urban wildilfe, movement, transportation, and humanity of all types can be found in the city, and all become art in this book. Open this book and come see Chicago, the hometown of the President of the United States. 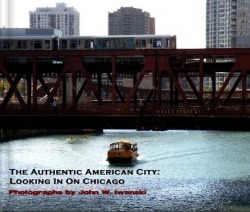 All photos in the book were taken in the city of Chicago this year. This book of Chicago photographs is very unique. It celebrates the city, lovingly and thoughtfully, but not in the typical way replicated over and over again by the endless stream of touristy photo books. You will see some photos that show off the best in the city skyline, but what you won’t see is the same old standard views over and over again. Instead, what this book brings you is a look into the atmospheres, scenes, people and moments that make up real life in Chicago, right now. The collection is artfully done, but really quite simple and unpretentious. 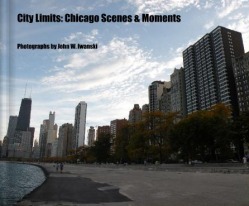 Every single photo in this book was taken within the city of Chicago. This is the Chicago book for everyone to enjoy, including those with an artist’s eye. If you are shopping for just the right Chicago-themed gift for someone special, or even for yourself, this could be just what you’re looking for. These books are currently self-published. Publishers, please contact the author for information on adding these books to your catalogue. Thank you.